In brief Contemplative Art uses arts practices to help induce a contemplative state of consciousness and provide personal insight, so in that way can be thought of as a contemplative practice. My contemplative art practice began in the late 1980’s with performance, wearable, video art in nature, followed in the 1990s with contemplative environmental art that developed in training with the performance artists Anna Halprin and Suprapto Suryodarmo. I combine insights from that experience and my contemplative and art practices to develop and facilitate contemplative art courses and workshops. Most recently I presented Creativity from the Inside Out: Learning Feelings at the Rhode Island School of Design, Providence RI, USA, a similar program at UNSW School of Art and Design, Sydney, Australia, and the workshop Contemplative Art in the Garden, held at the Randwick Organic Community Garden and funded by the Randwick City Council, Sydney. I offer similar workshops, combining contemplation and art practices and am currently developing courses in Contemplative Art. These courses reference the ancient practices of Zen and Tantric Art and explore the works of contemporary contemplative arts such as Agnes Martin, Hilma Klint, Wassily Kandinsky, Alex Grey, and others. ​In the course contemplative practices are combined with analysis of these artists’ work, focusing on concepts of direct experience, refined somatic awareness and principles from process art. This linking of practice and theory supports the appreciation of reflection in art practice and the ways this enhances the development of authenticity and creativity in art-making and daily life. They combine contemplative practices with analysis of these artists’ work, focusing on concepts of direct experience, refined somatic awareness and principles from process art. Though my understanding, and in brief, is that contemplative art uses arts practices to help induce a contemplative state of consciousness and in that way can be thought of as a contemplative practice. 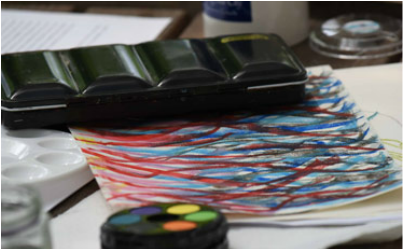 While any art medium and methods can be used, they are not engaged as they might commonly be to create an art ‘product’. Rather, they are employed to sustain and strengthen focus, or in some cases channel the divine as is done in ancient Hindu Tantric Art. The contemplative art I explore and teach is a form of process art, where the focus is on the process of the art-making as opposed to the finished product. Contemplative art uses arts practices to help induce a contemplative state of consciousness and in that way can be thought of as a contemplative practice. There are two aspects of this form of contemplative art. 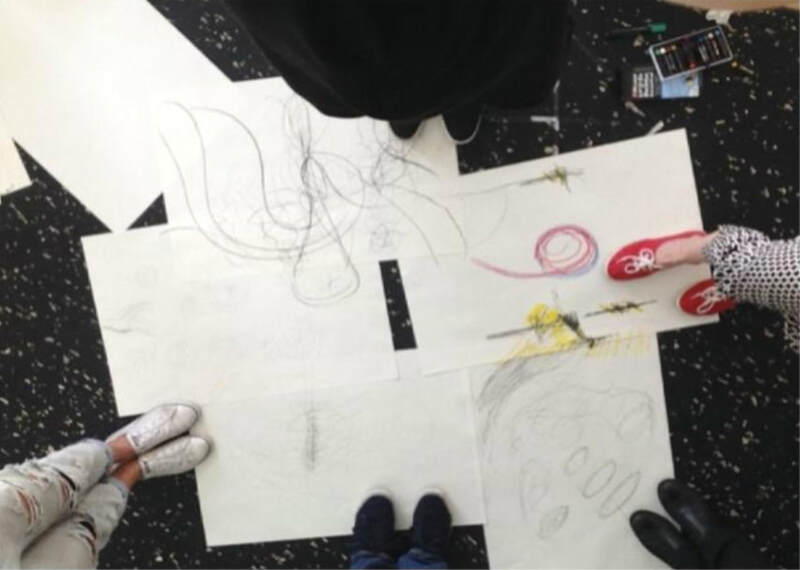 Firstly, the deep focus on the art making becomes a contemplative practice and secondly, this contemplative creative practice provides access to subjective or first-person experience and the lessons we may learn there. So the practitioner might use the art-making to sustain focus, or to help them describe what is happening in their first-person experience. It is important to remember that there is no right way of doing this practice; it is about the art-making process, about developing the ability to focus inwardly, to concentrate more deeply and feel what is happening in the internal landscape. It is a contemplative practice like formal sitting meditation, yoga or Ti Chi and like these practices it may also help the practitioner understand their inner workings. Above all else it’s important to enjoy the bodily sensations involved in the making while using them to help sustain focus. Similarly the artist and Zen practitioner Frederick Franck (1993) suggests that contemplative art is practiced as a means to find what he calls the ‘artist within’, who can lead us to “where we really live” (Franck, 1993, p. 18). This is done by using his technique of ‘seeing-drawing’ where the act of seeing and the act of drawing become fused, where we learn to see again. Franck describes seeing-drawing as ‘first-hand seeing’. This form of ‘seeing’ is at the heart of contemplative art, which Franck describes as his ‘way of meditation’. Though in this method the eyes aren’t closed, they’re “as wide open as possible” (ibid). Supporting the development of this way of ‘seeing’ is the primary aim in my contemplative art courses.